Posted in Charitable Activities, Merit Box News. 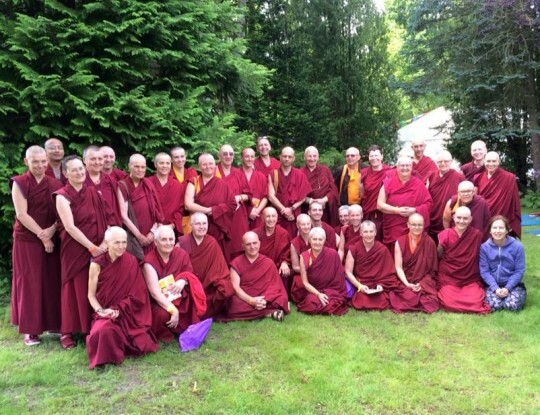 IMI Sangha members at Maitreya Instituut, Loenen, Netherlands, July 2015. Photo via IMI on Facebook. A Merit Box grant provided support for IMI Sangha to attend the teachings with Lama Zopa Rinpoce at Maitreya Instituut. With a special thanks for all those who submitted or helped coordinate Merit Box offerings over the past year, it’s time to rejoice! A new set of 14 Merit Box grants have been awarded for 2015. Disbursements will be sent out this month to support a number of Dharma endeavors. One grant provided support for IMI Sangha (FPMT nuns and monks) to attend the retreat with Lama Zopa Rinpoche at Maitreya Instituut Loenen, Netherlands in July. Buddha House, an FPMT center in Australia, is building statues of Ganapati and the 16 Arhats following Lama Zopa Rinpoche’s advice. The project will be partially funded by their forthcoming grant. 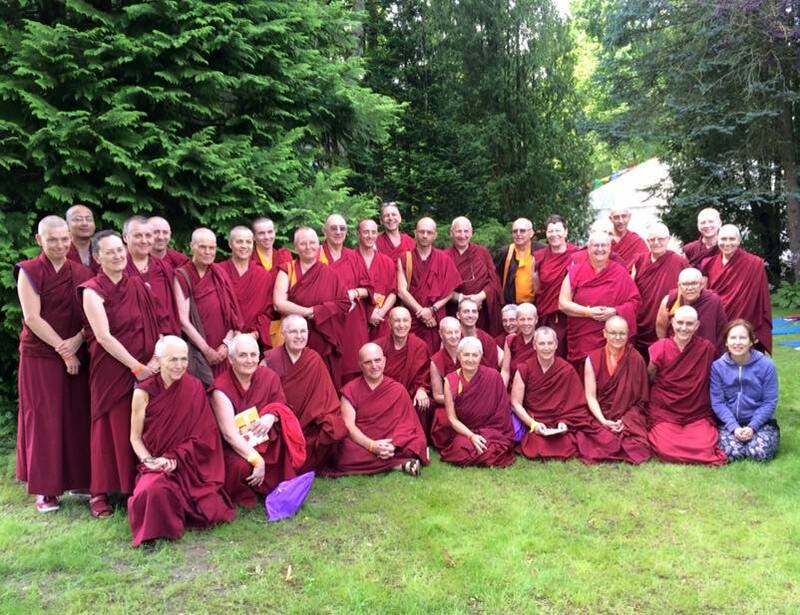 FPMT Europe regional meeting group photo, Maitreya Instituut, Loenen, Netherlands, July 2015. Photo by Ven. Roger Kunsang. FPMT Europe will receive much-needed support to further the coordination efforts between their very active regional and national offices. There are 50 centers, study groups, projects and services in Europe, including long-term retreat centers and two centers offering the FPMT Masters Program! A grant was awarded to Lama Yeshe Wisdom Archive for the publication of Lama Yeshe’s Gyalwa Gyatso teachings given at a course in Italy in 1983. They will be transcribed, edited and prepared into a print book and ebook for interested students around the world. 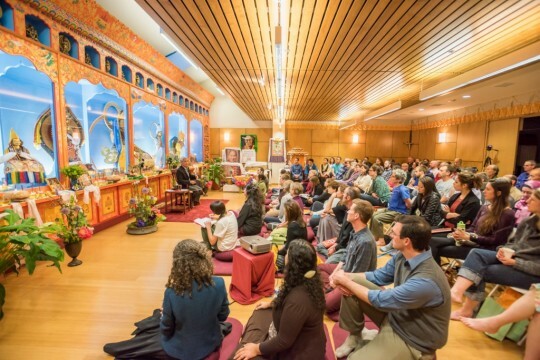 Dr. Thupten Jinpa speaking at Maitripa College in May 2015, the first event of the Mindfulness and Compassion Initiative, Portland, Oregon, USA. Photo courtesy of Maitripa College. At Maitripa College in the USA, grants have been awarded for two projects. One will fund the need for expanded shelving to house the immense collection of texts bequeathed to the Maitripa Library by their dear late professor, Buddhist scholar Dr. James Blumenthal. Eight other great projects will also receive funding support through the Merit Box Project. Please see the complete list of grants here! Becoming a Merit Box practitioner is easy! Order a free Merit Box kit for your altar, and start making offerings throughout the year into your Merit Box. Collection for the 2016 grants will take place from December 2015 through March 2016. Please contact meritbox@fpmt.org with any questions or requests.